5. You are a baseball manager and you win the pennant. 4. You are a baseball manager and you win the World Series. 3. You are a baseball player and you win the pennant. 2. You are a baseball player and you win the World Series. 1. You are a fan and you catch a foul ball in your cup of beer. While numbers 5-2 are pretty neat, they will never surpass the undeniable coolness of having a baseball plop right into your suds. It demonstrates astute hand-eye coordination—the coolest and most American coordination—and shows that you were in the process of drinking a beer, which is also very cool. During broadcasts of Major League Baseball games, there is always at least one camera dedicated to tracking the ball at all times, meaning you will be on TV if you catch one in your beer (and being on TV is too cool). No other sport allows this kind of ball-beer interaction. Basketballs and footballs are too big to fit into beer cups, and the NHL has built glass partitions for the sole purpose of preventing their precious pucks from landing in fans' beers. If you catch a foul ball the normal way, you are expected to give it to a nearby child. If you don't, the child may cry and you will you come across as a selfish jerk. If you catch it in your beer, however, it would be illegal to give it to a minor. "Sorry sport, this ball is coated in delicious beer. If I gave it to you, they'd send me to jail." "That's right. Now run along." 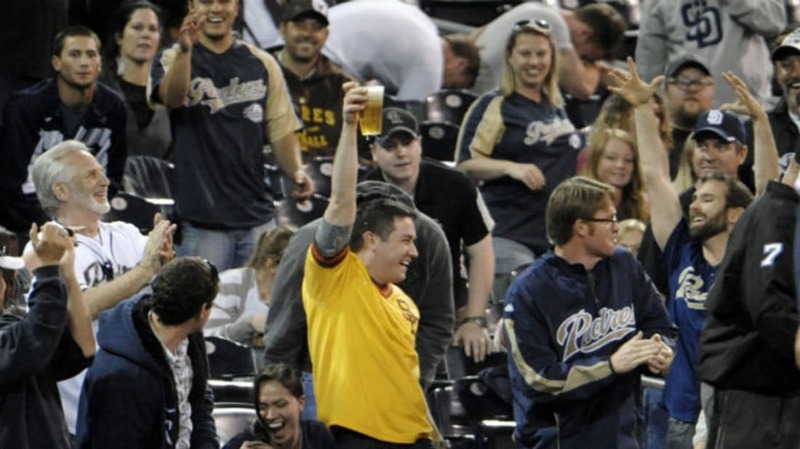 Physics and probability theory state that catching a foul ball in your beer is very rare. But as they say, "If it were easy, everyone would catch a foul ball in their beer." Any time someone does it, it's unique and beautiful, but there is certainly a hierarchy within the baseball-in-beer spectrum. This, from a 2013 Mariners game, is nearly the Platonic Ideal of catching a baseball in your beer. He snags it straight out of the air (no bounces), and immediately chugs what looks to be a dark stout while the filthy ball still sits inside the cup. The crowd reaction is what makes it really special, though. If you ever hear raucous cheering like that at a meaningless April ballgame, it means someone caught a Rawlings in their brew. The above catch is special because it tests the coolness of this gentleman—something that had already taken a considerable hit because he tucked his sunglasses into the front of his button-down. When the ball bounces into his beer, which splashes onto his shirt, he's understandably surprised. But—and this is the key here—he doesn't complain. He takes a big chug from his light beer and plays it up for the crowd. This guy looks to have trapped a ball that was bouncing and bumbling across the backs of seats with his beer. He didn't catch it, per se, but he's still awfully proud. And why shouldn't he be? He had the presence of mind to not pick it up with his hands. It's almost elegant, when you think about it. Call the game and give this young man the win.